Another marvel of architecture is the Red Fort and it could perhaps be singled out as yet another monument which should not escape the tourist's eyes. 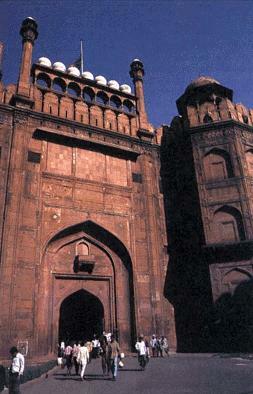 Known as 'lal qila' (lal means red and qila means fort), it is laid out along the river Yamuna as an irregular octagon. It is surrounded by a wall of about 2.4 Kilometers in circumferance and is built of Red Sandstone. The Mughal king Shah Jahan transferred his capital from Agra to Delhi and the fort was completed in 1648, nine years after the king shifted to this city. The fort has two main enterances, the Delhi Gate and the Lahori Gate which faces the famed Chandni Chowk market. Shah Jahan, incidentally was also the king who built the Taj Mahal of Agra. The fort has the Diwan-e-am, where the king would grant audience to the public to listen to their problems. The other feature is the Diwan-e-Khas (khas means special) where the king would grant audience to important people. Besides this, is the Rang Mahal, the water cooled apartment for the royal ladies. In the basement of the fort is a market where several traditional Indian goods can be purchased at nominal rates. Another attraction is the Light and Sound Show held in the evenings. This is the country's largest mosque where thousands of Muslims offer prayers even today. It was built in 1656 and is a tribute to the values of the Mughal Kings as also their commitment to religon and prayer. It lies opposite the Red Fort and is surrounded by a large number of shops which deal in a variety of goods. The flight of stairs and its large courtyard are something to be admired. Besides this there is a variety of the choicest non-vegetarian food available in several restaurants located around the comples. The ruins of the fort are located on a small hill which once stood on the banks of the river Yamuna.The construction was carried out by Sher Shah Suri any time between 1538 to 1545 A.D. The structure houses a mosque which has a double-storeyed octagonal tower. 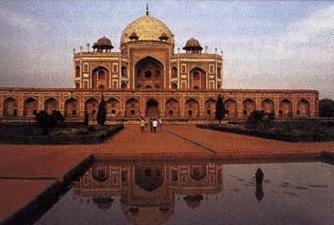 It is said that the Mughal king Humayun fell from the tower accidentaly and died. At the foot of the hill is a lake where the Delhi Tourism has arrangements for boating. 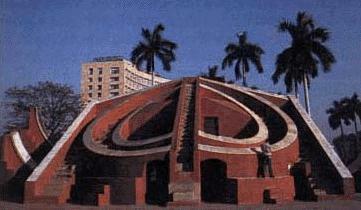 Within the Connaught Place area is the Jantar Mantar observatory built by the Rajput king of Jaipur, Sawai Jai Singh in 1724. It was believed to have been built with masonry instruments for observing the movements of the stars and the planets.The largest structure in the complex which is in the shape of a right-angled triangle, is actually a huge sun-dial. This tomb, which was built by emperor Humayun's wife, took eight years to complete and is regarded as an example of the early Mughal architecture. The emperor's wife, Begai Begum, was buried in the tomb and the structure is the first of its kind built in the centre of a well-planned garden. 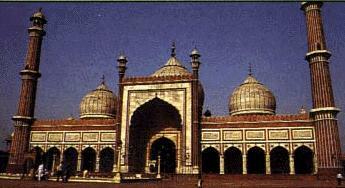 The combination of white marble and red sandstone was a great influence on later Mughal architecure. It is generally regarded as a prototype of the famed Taj Mahal of Agra. The garden tomb was built in 1753-54 soon after Safdarjang died. It is a red and brown sandstone with double storeyed towers in the corners and is one of the last examples of Mughal architecture. The tombs are in the midst of the famed Lodi Gardens and is believed to have been built by rulers of two dynasties, the Sayyaids and the Lodis. History has it that the tombs are remnants of another city that was sought to be built in Delhi. It was the eyes and ears of the Mughal's commercial instincts and is today one of the country's best known wholesale markets for textiles, electronic goods and watches. The entire area was designed by Jahanara Begum, Shah Jahan's favourite daughter and was then inhabited by the well-to-do families of the time. There is however a word of caution and that is that there are several elements who are believed to be selling duplicate goods and the tourist needs to be careful about this.